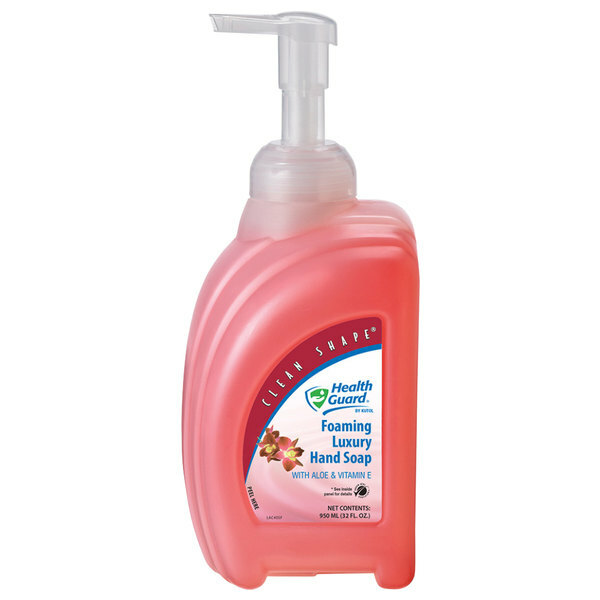 This Kutol 69078 Health Guard foaming hand soap is transparent pink in color and has a tropical scent. The Clean Shape bottle combines the convenience and hygiene of disposable containers with the style of premium fixtures. For added security, a wall bracket (sold separately) is available to keep counter areas clean. Each pump dispenses 0.75 mL per push and provides approximately 1300 uses per bottle. This item has been evaluated and certified by Green Seal&apos;s specific environmental standards to create a more sustainable world. Foams fairly well, though can be thin and run off but still great to use and not waste! Good for every day use since antibacterial can be hard on hands and also cause bacteria to be resistant to antibiotics eventually so this is a good option when you don't need to kill off all germs. Nice fresh fruit smell! This is a great hand soap to have in the bathrooms and employee hand sinks. Since it is foaming it does not leave any drops from the dispenser on the counters, meaning less clean-up later on. Great smell and quality. It foams really nicely and the shape allows fit above hand wash sink. It foams really well and seems to do a good job of sanitizing. This hand soap is great for our small gym. The soap foams nicely and quickly gets hands nice and clean, also smells great! So glad we found WEBstaurant, they have great products for all types of businesses! Great product self contained and ready to use. No fumbling to open a wall mounted dispenser and try to install refills without spilling. And you can see when it gets low, and even pour the remaining product into another dispenser to keep from wasting the remaining product when it is nearing empty. Webstaurant ran a special and ran out. They shipped part of the order via truck, and shipped the backorder via FedEx(which arrived before the larger pallet of misc supplies). Service and prices have always been VERY good. Best soap and inexpensive. It smells really good, not like the soap you get that smells like a hospital. Lasts a really long time since it foams up, you only need one squirt. The kutol foaming hand soap is great to be put any where it cleans hands really well and greasy hands great as well and at such a great price! Kutol foaming hand soap cleans even greasy hands good. The smell is great and it looks ok any where you set it. I will order more. this stuff is great. it lasts so long its crazy. it leaves your hands smelling nice and fresh and cleans all the bacteria off of you too. Excellent foaming hand soap! Great for any restaurant and good for the home too! Good price! The bottle design allows it to easily fit right in! !